Welcome to grow milkweed plants podcast. If you hear me stuttering it's because it's been a while since I've been on air to podcast. Thanks for joining me. I’m your host, Brad Grimm. Last time I did the podcast was September. I was just back from a trip to Yosemite where there was Monarchs Milkweed & More. Nearly four months have past since visiting Yosemite and there's a lot to talk about. I've been busy. My wife and I recently purchased a new home in Sparks Nevada. Which is where I am podcasting from now. We're going to be building a backyard landscaping. So in December I worked a lot of hours at my day job in order to make a little extra money to put towards landscaping. We used a couple of bucks to take a vacation, which is the main subject of this show today. Vacation brought us to the coast of California where I've been before; Pacific Grove. The Monarch Butterfly Sanctuary in Pacific Grove is a hot-spot for monarch butterflies where they overwinter. January is definitely Winter on the coastside bringing rainy days most of the time. The sun did come out briefly on the last day of our trip and the monarchs started to become active. I have some video footage in the show notes on the post that accompanies this podcast’s. The Western monarchs spend the winter in over 200 overwintering sites along California from San Diego to just north of San Francisco. Somewhere in the middle is Pacific Grove and there's also Andrew Molera State Beach which is another location that I went to. Further south is the highlight location for 2015-2016 wintering monarchs and that's Pismo Beach. Pismo Beach may have the highest number of overwintering monarchs. You have to act fast to go see them because spring is coming and those marks will begin their migration from their overwintering sites across North America very soon. Here at the homestead in Sparks Nevada it's the dead of winter and temperatures are pleasantly above 32° right now. However it was a different story on January 4th. My wife had just returned from visiting family in Idaho after picking up at the airport we check the weather report and decided that a winter storm was moving into the Sierra Mountains which would create an impasse and Donner Pass. As the snow move in we decide to contact the hotel that we will be staying in California. We began our vacation a little bit early. 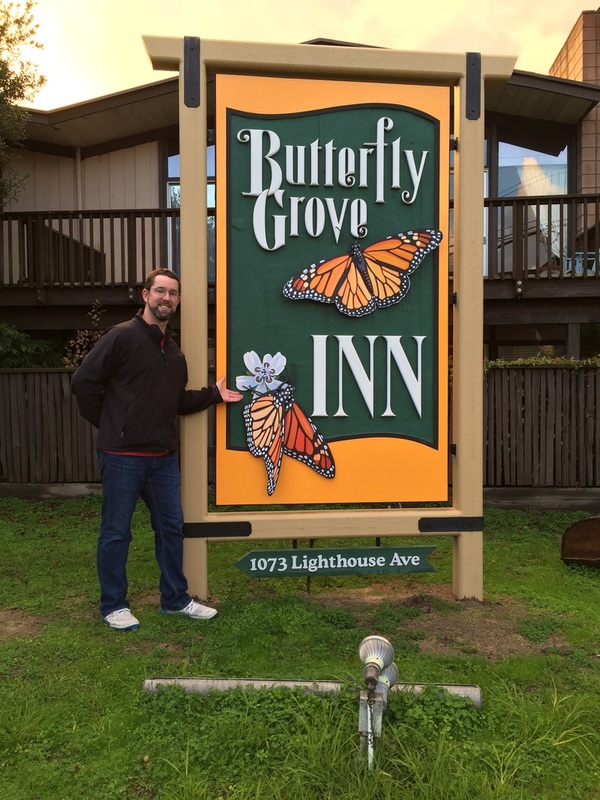 The Monarch Grove Inn which is located by the Monarch Grove Sanctuary in Pacific Grove California was able to accommodate us for an extra night. At about 8 PM we hit the road. We made it over the pass with light snow falling. Rain throughout California along the drive. We arrived at the sanctuary just before 1 AM. We couldn’t see the monarchs that night because of the darkness. There was no visibility into the trees and I didn't know exactly where to look. 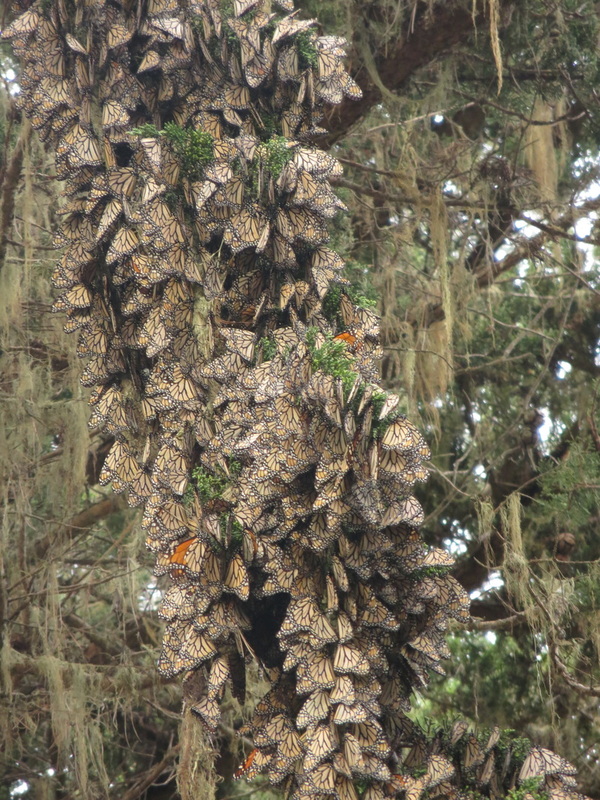 However the following morning on January 5th I stepped outside the hotel room and pleasantly was greeted by thousands of monarch butterflies hanging in the tree. The Monarch Butterfly Sanctuary at Pacific Grove has a nice trail that takes you thru a grove of trees. Thats traditionally where the monarch butterflies are expected to be overwintering. However just outside of the sanctuary on the property of the Monarch Grove Inn is where you will find the monarch butterflies today. I don't have a good tool to estimate the number of monarch butterflies but there are well over 1,000 in clusters that I photographed. It's kind of a peculiar thing to see butterflies overwintering. Because when they're over wintering in the trees are really just not doing anything. It’s called diapause. They have slow there metabolism, if that's what you call it, and they're extremely inactive. The temperatures are low. Their body temperatures are low. 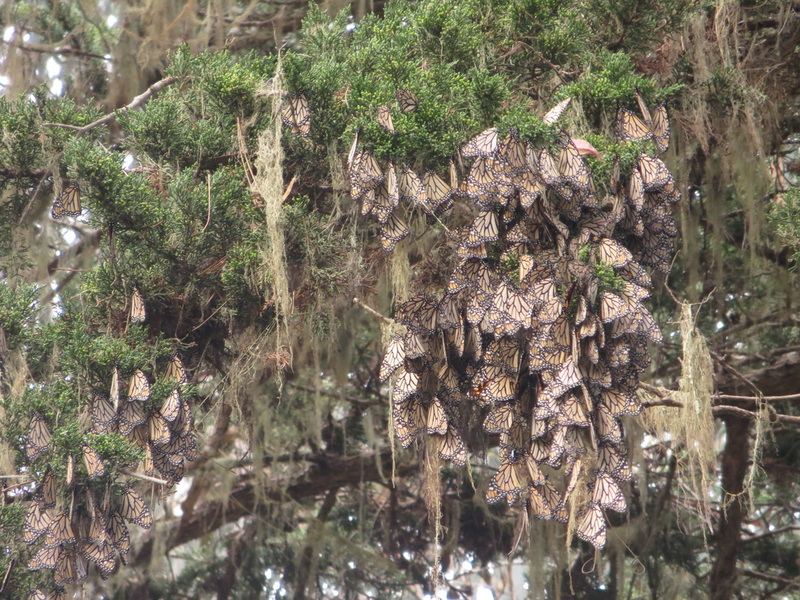 The butterflies are extremely inactive as they are clumped together in the trees. If one were to move then the rest would be at risk of perhaps falling from the tree and landing on the cold, wet street below. So the butterflies are extremely inactive. This isn’t to say that it isn’t exciting to watch them. However after a couple of hours looking at monarchs that aren’t moving you can tell that it is much different than during the summer when the butterflies are flying around searching for milkweed. Laying eggs. Pollinating on nectar plants and extremely active. Its a very big dichotomy between summer monarchs and overwintering monarchs. However if you haven't seen overwinter monarchs, I strongly encourage you to find a location to go to. Monarch tourism is on the rise not only in Butterfly Town U.S.A. which is slogan of Pacific Grove but also in Mexico. In Mexico, Monarch Mountain, which is the area where the monarchs can be found in central Mexico has seen approximately a 200% increase in Monarch butterfly tourism in the region since just last year. Monarchs in Mexico are very popular and there's a lot of accommodations for monarch tourism into Mexico You can find more information about this on the link that I'll provide accompanying in this podcast. 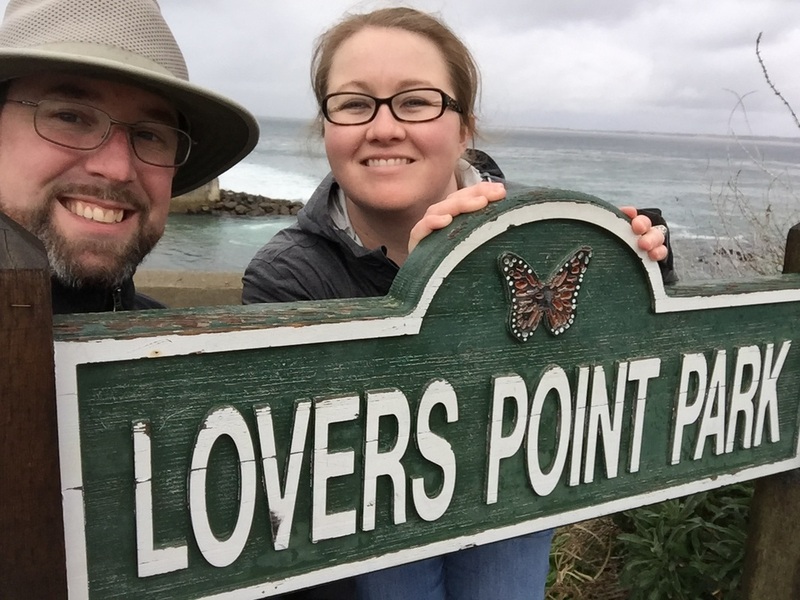 On the second and third day of our stay in Pacific Grove we visited the Monterey Bay Aquarium and also drove 17 Mile Drive through the exclusive communities on the coast there. 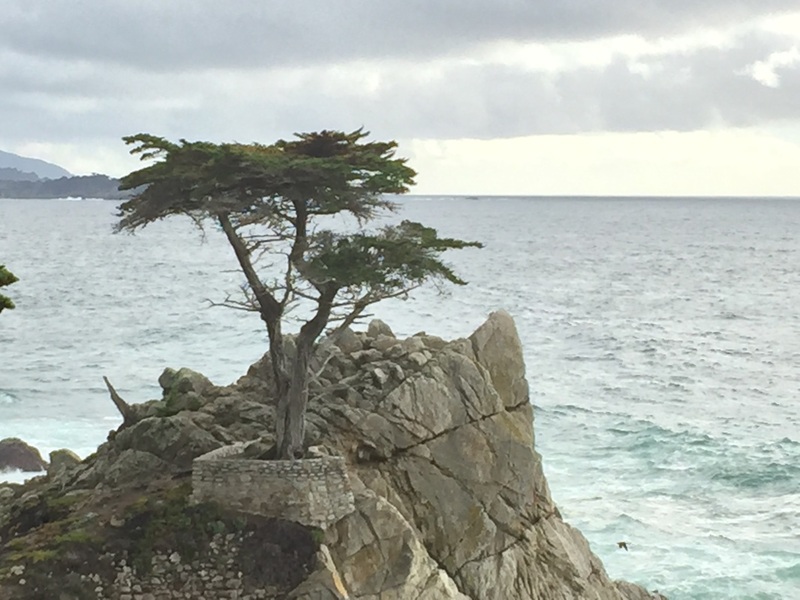 You may recognize that the logo for the Pebble Beach Company is The Lone Cypress we were able to see that Lone Cypress and large waves breaking on the shore. It was a very senic drive. Further down the coast on the following day we went to Andrew Molera State Park and Andrew Molera State Beach. This area is a California State Park and has as a cabin called Cooper Cabin which is built in around 1888 I believe. The cabin was a pioneer cabin which still stands today. In the photographs provided by the state of California's website there were some small eucalyptus trees not more than 20 or 30 feet tall. Those trees today are over 200 feet tall and there’s currently monarch butterflies overwintering in them. I’ll provide some additional photographs of those butterflies that we saw in the link that accompanies this podcast. The weather was very warm and Andrew Molera State Park and the sun and out for a while. In addition to seeing the monarch butterflies there. There were also California condors. I believe we saw as many as five California condors. One of them was soaring right above the monarch butterflies and I almost captured a photo of the condor in the background and the monarch in foreground. That site was very impressive. Butterflies were extremely active duty heat and I couldn't identify any particular clusters there. The early data from the Western Monarch Count indicates that Andrew Molera State Park has approximately 6,015 overwintering monarch butterflies which is only slightly less Pacific Grove but still pails in comparison to Pismo Beach for the 2015-2016 season. Pismo Beach has upwards of 20,000 monarch butterflies. That wrapped up our vacation to California and the butterflies. Now I did skip ahead a lot from September when I did last podcast. I do have in store for you coming up a 2015 season monarch butterfly rearing round-up. In which, I'll go over all the different monarch butterflies that I raised and released here in Sparks NV. Some of the challenges that I encountered and of course the success stories that go along with them. If you're interested in helping the monarch butterfly by providing habitat in the form of milkweed plants. I encourage you to go to the website www.growmilkweedplants.com and begin your search for milkweed seeds or milkweed nurseries that are in your area. Recently I was able to add two additional varieties of milkweed seed to my seed store. Butterfly weed, Asclepias tuberosa. As well as Swamp milkweed, Asclepias incarnata. I also picked up a couple of limited addition monarch butterfly stickers. Pacific Grove Monarch Butterfly stickers by Tim Ward. You can view those in the store at growmilkweedplants.com and I think you for your support in advance. Its important to note that milkweed seeds, like many perennial wildflower seeds, enjoy the winter cold-stratification that the snow provides. So remember; every time it snows, sow more milkweed. It looks like it’s beginning to snow here so I’m going to go out and plant the few more milkweed seeds in my neighborhood. Thanks for joining me at grow milkweed plants podcast episode 11. As always, thank you for growing milkweed plants. The monarch butterflies appreciate you. This butterfly stayed on the flower for nearly four hours. As midday weather warmed to 55° if flew away. The flower is only inches from where I am sitting right now.